In the college English courses I teach, Homer’s Iliad and Odyssey form our core texts. Students write in response to the timeless stories and use the speeches of Achilles, Nestor, Ajax, and, of course, Odysseus as lessons in rhetoric. These lessons are particularly rich in the Odyssey, as cunning Odysseus must talk his way into favor and out of danger during his long journey home. Homer often uses the word metis to describe Odysseus. We can translate the word to mean “cunning, skill, or craft.” According to Hesiod, Zeus took a titaness named Metis as his first consort. While Metis with pregnant with their daughter, Zeus ate her, fearing a prophecy that their children, “surpassing in wisdom,” might usurp his dominion over the heavens. The child, however, was born despite her father’s treachery: she was the goddess Athena. While Homer does not invoke this myth, he does link Athena to the qualities of metis, and in both epics Athena inspires martial strategies, powerful speeches, and material crafts such as weaving. She loves Odysseus, whom Homer calls “the man of twists and turns” (1.1), and also Odysseus’ faithful wife, Penelope the “matchless queen of cunning” (2.95). Both Odysseus and Penelope survive their epic difficulties through cunning and craft, wise words and the works of their hands. Odysseus boasts to the Cyclops, “I am Odysseus, son of Laertes, known to the world / for every kind of craft — my fame has reached to the skies” (9.20-21). Meanwhile, Penelope deceives her predatory suitors for years by begging time to weave a funeral shroud for her father-in-law, only to secretly unravel her day’s weaving each night. Not surprisingly, Homer often uses material crafts–weaving in particular–as a metaphor for Odysseus’ clever words and ideas. Discussing these passages with my students, I realize that the metaphors drawn from these crafts are utterly foreign to almost all of the young writers in my charge. When Homer first told his tales, every household would have had a loom, and men and women alike could imagine what it means to weave a plan: to order one’s ideas carefully, arranging them in meaningful order, just as a woman would use warp and weft to create a picture on the loom. 1) My crafts teach me to demand good materials. This is a lesson I learned from knitting long before I began to sew seriously. When I first learned to knit, I simply bought whatever was available at the department store, usually brightly-dyed skeins of acrylic (read: mostly plastic) yarn. I picked up the various knit and purl stitches quickly, but I thought the projects I was producing were rather tacky: they seemed garish and clumsy. Dissatisfied, I began to seek other materials. I discovered whole worlds of wools, from fine merino to ultra-soft baby alpaca, as well as the smooth, strong fibers of real linen, cotton, and bamboo yarns. When I worked with these yarns, it was like moving from crayons to oil pastels. I was using exactly the same stitches that I had with the cheaper yarns, but my finished products were remarkably better. I hope that I choose my subjects for writing with the same discernment. We live in a babbling world, where headlines range from the sensationalist to the inane. When I write, and when I give my students writing tasks, I try to select topics with the same virtues as the materials I love to knit and sew: strength, beauty, ethical origins, and more. 2) My crafts remind me that good tools matter. 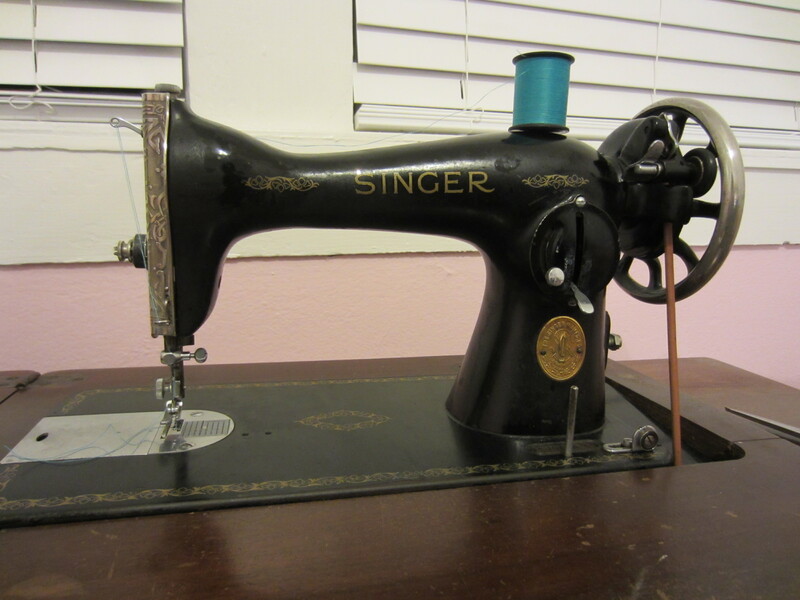 I am fortunate to have two very good sewing machines: an electric New Home model handed down from my mother, and this beauty, a treadle-powered Singer 15-88. Both run smoothly, and their metal bodies are solid and simple to maintain. 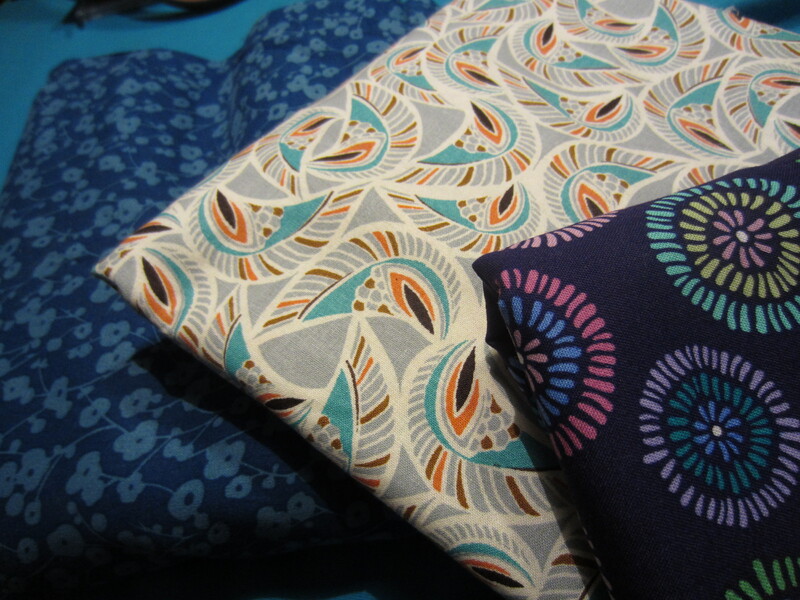 When I first began sewing on my own, the machine I had was finnicky, jolting my stitches and tangling itself constantly. It made me hate sewing because I couldn’t control my speed, and I didn’t understand how to fix the machine’s problems. So also with writing. My “tools” consist of my skills and resources: a practiced memory for vocabulary, for example, or the decades of reading that have supplied me with supple, lively sentence structures. Rhetorical appeals, figurative language, inductive and deductive models for reasoning: these and more allow me to shape the sound and structure of a text. 3) My crafts teach me to write as an idealist and publish as a realist. With the Advent of warmer weather, I recently decided I needed some summer dresses. I found a pattern that seemed just suited to my needs (“Washi” from Made by Rae). I made it once and though–on the whole–it was a success: the pockets were perfect, the bodice fit, the skirt was comfortable. The dress was wearable. And yet, it wasn’t perfect. 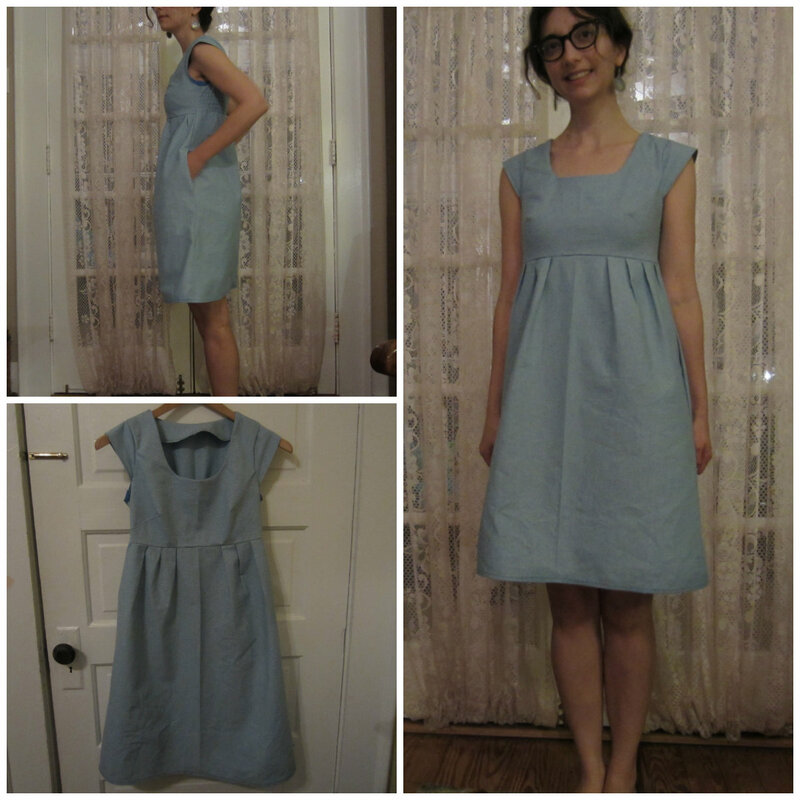 The fabric (a stiff chambray from a yard sale) didn’t have quite the drape I had hoped for, and the waist was too high to be perfectly flattering for my figure. It was wearable. It would do the job, but I decided to take a risk–and several more hours–to try again. I was more careful this time. I examined my material more closely, testing its weight and drape. I deviated from the pattern, lengthening the bodice and skirt. I lined the bodice, too, to make the dress more substantial and modest. I loved the second dress. It sits and swings with just a bit more grace. So often I find the same patterns in my writing. I pen a sentence and think, “That will do,” but I cannot rest if I know it could be better. And so I try again, slashing one verb and patching in another. Lengthening a paragraph until it covers a topic sufficiently. Rewriting a thesis again and again, like a line of unruly stitches, until it holds the ideas of the paper together. I revise relentlessly, often working through six or seven complete drafts before I consider a text ready. The danger, of course, is that I might never think the text is good enough. My desire to write the perfect paper, to create a masterpiece, can lead to anxiety and timidity when it comes to publishing, whether the text is a blog entry, a short story, or an academic article. Here, too, my crafts help. Even my second Washi dress was far from perfect: the first time I wore it, I realized I had missed a raw edge when sewing the sleeves, and the armscyes are a little too high. I could have cast the dress aside and started again, but I cannot afford to keep a closet full of half-finished dresses. Instead, at some point I must simply decide to wear the dress, conscious of its flaws but not blind to its real beauty. I sometimes wonder if I should require my writing students to take up a hand-craft so that they could create their own analogies between writing and craft, metis in writing and in work. I have gained much from friends who also find ways to work with both head and hands (one, a fellow literature professor at my university, blogs about his woodworking here). As we continue to follow Odysseus home, I hope that my students and I will, together, learn to cultivate crafts that show “a genius for lovely work, and a fine mind too” (7.128). Homer. The Odyssey. Trans. Robert Fagles. New York: Penguin, 1996. Print. Previous Post in my hands and on my mind…..